There are two options or sets of readings in the Revised Common Lectionary (RCL) for Sunday week (26 February 2017), the Sunday before Lent. The first, Option A, is the set of readings for the Transfiguration: Exodus 24: 12-18; Psalm 2 or 99; II Peter 1: 16-21; and Matthew 17: 1-9. The second, Option B, for Proper B, is: Genesis 6: 9-22, 7: 24, 8: 14-19; Psalm 46; Romans 1: 16-17, 3: 22b-28 (29-31); and Matthew 7: 21-29. The Gospel reading in Option B brings to an end our series of Gospel readings on the Sermon on the Mount. The Gospel reading in Option A also takes us to the top of a mountain for a new understanding of the covenant between God and us. Six days later, Jesus took with him Peter and James and his brother John and led them up a high mountain, by themselves. And he was transfigured before them, and his face shone like the sun, and his clothes became dazzling white. Suddenly there appeared to them Moses and Elijah, talking with him. Then Peter said to Jesus, ‘Lord, it is good for us to be here; if you wish, I will make three dwellings here, one for you, one for Moses, and one for Elijah.’ While he was still speaking, suddenly a bright cloud overshadowed them, and from the cloud a voice said, ‘This is my Son, the Beloved; with him I am well pleased; listen to him!’ When the disciples heard this, they fell to the ground and were overcome by fear. But Jesus came and touched them, saying, ‘Get up and do not be afraid.’ And when they looked up, they saw no one except Jesus himself alone. Of course, there is an obvious question: Why is there no Transfiguration narrative in Saint John’s Gospel? But then, there is no Eucharistic institution narrative in the Fourth Gospel either. Perhaps we could say that the Fourth Gospel is shot through with the Transfiguration and the light of the Transfiguration, from beginning to end, just as it is shot through with Eucharistic narratives from beginning to end. None of the accounts identifies the “high mountain” by name. The earliest identification of the mountain as Mount Tabor was by Jerome in the late fourth century. ● John receives his Revelation in the cave at the top of the mountain on Patmos. As for the cloud, as three Synoptic Gospels describe the cloud’s descent in terms of overshadowing (episkiazein), which in the Greek is a pun on the word tent (skenas), but is also the same word used to describe the Holy Spirit overshadowing the Virgin Mary at the Annunciation (Luke 1: 35). In this sense, the Transfiguration is also considered the ‘Small Epiphany’ – the ‘Great Epiphany’ being the Baptism of Christ, when the Holy Trinity appears in a similar pattern). Moses and Elijah show that the Law and the Prophets point to the coming of Christ, and their recognition of and conversation with Christ symbolise how he fulfils ‘the law and the prophets’ (Matthew 5: 17-19). Moses and Elijah also stand for the living and dead, for Moses died and his burial place is known, while Elijah was taken alive into heaven in order to appear again to announce the time of God’s salvation. The Transfiguration reveals Christ’s identity as the Son of God. In the Gospel, after the voice speaks, Elijah and Moses have disappeared, and Christ and the three head down the mountain. The three ask themselves what he means by ‘risen from the dead’ (Mark 9: 9-10). When they ask Jesus about Elijah, he responds: ‘Elijah is indeed coming and will restore all things; but I tell you that Elijah has already come …’ (Mark 9: 12-13). He tells them to keep these things a secret until the Son of Man has risen from the dead. Yet, in keeping with the Messianic secret, he tells the three not to tell others what they have seen until he has risen on the third day after his death. Saint Paul uses the Greek word for Transfiguration, metamorphosis (μεταμόρφωσις), as found in the Synoptic Gospels when he describes how the Christian is to be transfigured, transformed, into the image of Christ (II Corinthians 3: 18). Transfiguration is a profound change, by God, in Christ, through the Spirit. And so, the Transfiguration reveals to us our ultimate destiny as Christians, the ultimate destiny of all people and all creation to be transformed and glorified by the majestic splendour of God himself. Peter’s reference to the booths could imply that the Transfiguration took place during the time of the Feast of Tabernacles, when Biblical Jews were camping out in the fields for the grape harvest. This Feast also recalled the wanderings in the wilderness recorded in the Book Exodus. In early Church tradition, the Transfiguration is connected with the approaching death and resurrection of Christ, and so was said to have taken place 40 days before the Crucifixion. There is historical evidence that the feast of the Transfiguration belonged first to the pre-Easter season of the Church the Transfiguration was first celebrated on one of the Sundays of Lent. A sermon on the Transfiguration was preached in Lent by John Chrysostom while he was a priest in Antioch in 390. Saint Gregory Palamas, the great teacher of the Transfiguration, is commemorated during Lent. We know from iconographic evidence that the Feast of the Transfiguration was celebrated on Mount Sinai from the mid-fifth century, and the feast may have reached Constantinople in the late seventh century. From 1474 until at least 1969, it was observed in the Roman Catholic Church on the Second Sunday in Lent. In some modern calendars, including Roman Catholic, Lutheran and Anglican calendars, the Transfiguration is now commemorated on the Sunday before Lent. However, traditionally, the Feast of the Transfiguration is observed in the Anglican, Roman Catholic and Orthodox calendars on 6 August. It may have been moved there because 6 August is 40 days before 14 September, the Feast of the Holy Cross, so keeping the tradition that the Transfiguration took place 40 days before the Crucifixion. What was the Anglican attitude to the Feast of the Transfiguration? It disappeared from the 1549 Book of Common Prayer, and when it reappeared in the 1662 Book of Common Prayer it was only in the calendar without any other provisions. In the Book of Common Prayer 2004, the Church of Ireland is provided with Collects and Post-Communion prayers for the Feast of the Transfiguration on 6 August, and there is an alternative provision to mark the Transfiguration on the Sunday before Lent. Too often in the Orthodox world, the celebrations of the Feast of the Transfiguration are overshadowed by those of the Dormition on 15 August. Yet, the summer celebration of the feast lends itself very well to the theme of Transfiguration. ● The ‘Icon of Christ Not Made by Hands’ (16 August). Orthodox celebrations of the Transfiguration are preceded by a one-day Forefeast, including Great Vespers and an All-Night Vigil on the eve of the Feast. The day itself celebrated with the Divine Liturgy of Saint John Chrysostom, preceded by the Matins service. On the day of the Transfiguration, grapes are traditionally brought to church to be blessed after the Divine Liturgy – although, if grapes are not available in the area, apples or some other fruit may be brought. This begins the ‘Blessing of the First Fruits’ for the year. The blessing of grapes and other fruits and vegetables is a beautiful sign of the final transfiguration of all things in Christ. It signifies the ultimate flowering and fruitfulness of all creation in the paradise of God’s unending Kingdom of Life where all will be transformed by the glory of Christ. The Afterfeast lasts for eight days, ending on the day before the Forefeast of the Dormition. In the Orthodox Church, the Transfiguration falls during the Dormition Fast, but the fast is relaxed and the consumption of fish, wine and oil is allowed on this day. But the Transfiguration also has associations with ordination: from the time of Pope Leo the Great (died 460), the Transfiguration was the Gospel reading set for Ember Saturday, the day before ordinations took place. 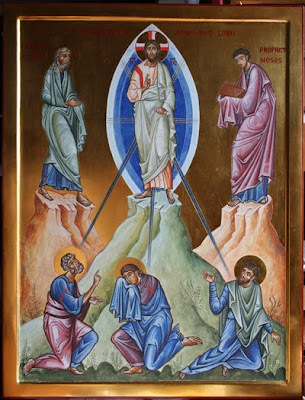 The Transfiguration is a popular name for Orthodox churches and monasteries, and – as one of the twelve Great Feasts of the Church – it is also a popular subject for icons, and it is said to be the scene on which trainee icon-writers traditionally cut their teeth. 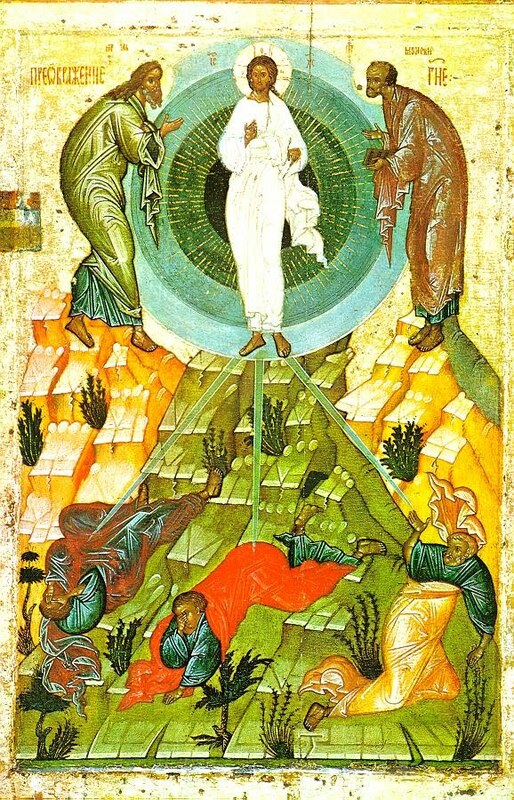 The Transfiguration is among the oldest feasts of the Christian East and was depicted on the mosaic in the apse of the main church (Katholikon) in Saint Catherine’s monastery on Mount Sinai as early as 565. 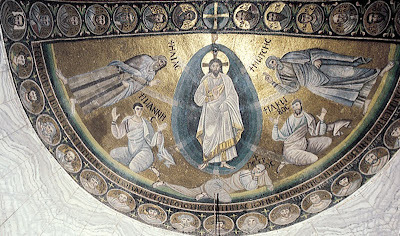 This mosaic is a notable early interpretation of the Transfiguration in Byzantine iconography, and has been central to the development of later iconography. Christ, with black hair and beard, is in an oval of ‘glory’ between Moses and Elijah, representing the Law and the Prophets. Below, the three awed disciples are seen in different poses. The soffit of the triumphal arch has medallions with busts of the twelve Apostles, but the three Apostles who are witnesses to the Transfiguration are replaced in those medallions by Paul, Thaddaeus and Matthias. The base of the apse is bordered with another series of 15 medallions with busts of the Prophets. This monumental composition from the late 6th century is a true masterpiece of Byzantine art. The subject is treated with intense light and profound spirituality, and in a most expressive and transcendental manner the maker of this mosaic succeeds in representing the doctrine of the two natures of Christ, as formulated in 451 AD by the Ecumenical Council of Chalcedon. The spandrels of the arch are occupied by two flying angles and the centre by the Amnos (Lamb). The Virgin Mary is depicted in a bust on the south side and Saint John the Baptist on the north. This superb mosaic was the work of master mosaic workers who probably came from Constantinople. Because of the sanctity and spirituality of the site and the famous mosaic of the Transfiguration, the Katholikon became known as the Church of the Transfiguration of Christ the Saviour. Theophanes the Greek (Θεοφάνης, ca 1340 – ca 1410) was one of the greatest iconographers in Muscovite Russia, and was noted as the teacher and mentor of the great Andrei Rublev. This icon of the Transfiguration was probably written in the year 1403. Theophanes was born in Constantinople ca 1340. He moved to Novgorod in 1370, and from there to Moscow in 1395. His style is unsurpassed in the expression he achieves by almost mono-coloured painting. His contemporaries said he appeared to be ‘painting with a broom,’ referring to the bold, broad execution in some of his finest frescoes, which are unique in the larger Byzantine tradition. Theophanes was described by his contemporaries in Moscow as being ‘learned in philosophy,’ a reflection on his broad education and erudition. 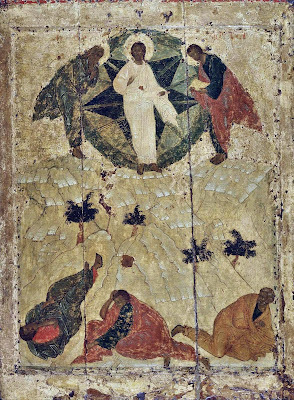 A hint of his education and erudition is found in his icon of the Transfiguration, now in the Tretyakov Gallery in Moscow. The arresting geometry and brilliance of the figure of Christ in this icon is balanced against the ordered disarray of the earthbound Apostles, who are strewn about like rag dolls in the uncreated Light of Mount Tabor. The balance of mathematical harmony in line and shape, with the masterful use of an earth-tone palette and precious gold leaf, evoke a spirituality that is immensely powerful and speaks to the painter’s genius. Unlike many icons in the earlier Greek style, this icon has no golden background that sweeps all the figures into eternity. While every part of the plane is occupied, the main focus is on the Transfigured Christ and on the disciples who are overawed by the splendour of his glory. The gold-backed Christ figure, gleaming in white, draws together the perspectives on eternity and history, draws together the past, represented by Moses and Elijah, the present, represented by the three disciples, and the future, with the understanding in the Transfiguration of who the disciples – indeed who we – are who we are called to be. The rays of glory radiating from Christ, who is elevated, seem to relate the apostles to Christ by means of a triangular composition: Christ is above at the highest point and the apostles are below. And so, as you look at this icon, your eye is taken straight to the central figure of Christ, bathed in white, with Moses and Elijah on either side, each in deep yellow and brown and Moses holding a tablet. Christ is holding a scroll, symbolic of his authority and of the fact that he is the Living Word of God. Because of the compositional focus and the colour, Christ is the central focal point of the icon. While Moses and Elijah are level with him, they are not presented in a way that would divert our attention from Christ. Christ’s raiment is a bright whitish colour radiating in several directions almost like a star. Behind him is a silvery-blue circle permeated with golden shafts of light that probably represents both the cloud and his glory. 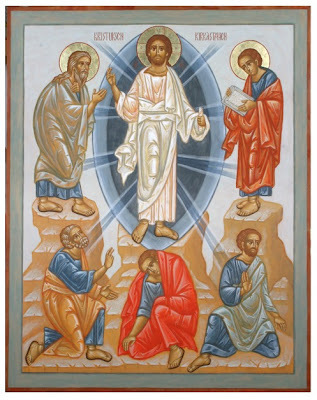 The colour scheme of the icon helps to express the nature of the Transfiguration: although the overall background colours are shades of orange, yellow, and black, the light emitted from Christ is casting a blue-green hue over the apostles who are witnesses of it. The three apostles, Peter, James and John, like Moses and Elijah, are in tallow and brown. They are terror-struck by what is going on, displaying their amazement and reactions to the mightiness of Christ’s glory. But they are not cut off from the action, for each of them is at the receiving end of a blue ray emanating from Christ. 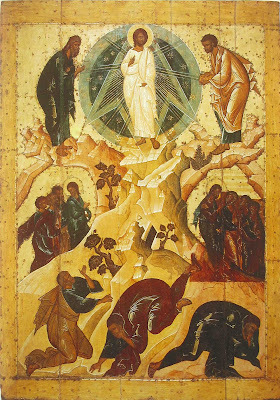 There are two smaller scenes in this icon that did not appear in earlier icons of the Transfiguration, but have influenced every icon of the Transfiguration ever since. These two, almost identical and parallel scenes, can be seen on the left and the right sides of the icon. Almost midway between Christ and the apostles are two caves in which four figures stand, observing the scene. These scenes represent the ascent and descent of the mount by Christ and the apostles, and are examples of the multiple temporalities that can exist in icons. As if to both exaggerate and to minimise the distance between the two zones, these are much smaller scenes. Yet, Christ stands out as the leader: he leads them up the mountain, but he also leads them down. The icon of the Transfiguration by Theophanes is worth comparing with two other representations of this theme produced in the century or so that followed. The second icon is the work of Andrei Rublev, the disciple of Theophanes the Greek. This icon was written in 1405 for the Liturgical Feast Row in the iconostasis (icon screen) of the Cathedral of the Annunciation in the Kremlin in Moscow. As in his icon of the Visitation of Abraham, or the Holy Trinity, Rublev discards everything superficial, leaving only the six essential figures, beautifully composed into two groups of three and connected only by the rays of light emanating from the mandorla of Christ. The group at the top reminds us of Rublev’s greatest masterpiece by the gentle curvature of the bodies of Elijah and Moses, enveloping, as it were, the central figure of Christ. The soft colours, dominated by the ochre of the background, stand in direct contrast to the bright work from Novgorod, and to the rich palette of Theophanes. This icon of the Transfiguration was possibly written in the icon workshops in the northern Russian town of Novgorod in the late 15th or early 16th century. The manner of painting and the surviving inscriptions indicate a date in the 16th century. Probably for speed of execution, the master copied the figures of the prophets and apostles from standard images, and only details reveal their individual natures – a few variations in facial feature, the colour of the robes. Yet, this icon surprises the viewer with its monumental composition and brightness of colours. At the same time, it shows unmistakable signs of Muscovite influences in the elongated proportions of the figures. 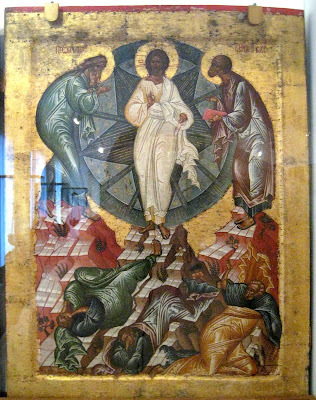 The same iconography can be seen in the Transfiguration of Christ, ca 1550, by an unknown Cretan icon writer, and now in the Ikonen-Museum in Recklinghausen. We can see the same arrangement on this icon. The transfigured Christ stands in an aureole between the prophets Moses and Elijah, while the three apostles, Peter, John and James, throw themselves to the ground in fear, dazzled by the supernatural light. Christ stands on a sharp rocky outcrop in a radiant white garment, giving the blessing with his right hand and holding a closed scroll in his left. He is surrounded by an oval aureole of light, in which is inscribed a rectangle with inwardly curving sides, from which rays emanate towards Elijah and Moses, each standing on his own mountain summit in an attitude of veneration. Three further rays strike the three disciples, who have thrown themselves to the ground in prayer. To this basic scheme two other events have been added, one preceding, the other following the Transfiguration. On the left, Christ is climbing the mountain with the three disciples, on the right we see their descent. In these works, Theophanes places Christ in a round aureole or mandorla. His Athonite icons are modelled on a miniature then in a monastery near Thessaloniki. The Stavronikita icon is chiefly characterised by a balanced, symmetrical arrangement of the figures and the details of the landscape. In the principal icon in Pantokrator, Theophanes includes the innovation introduced by Theophanes the Greek 130 years earlier in Moscow, showing Christ leading the three disciples up the mountain and down again. 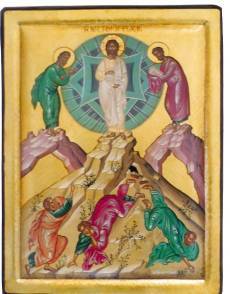 The Transfiguration is one of the 12 icons which Jyrki Pouta, a Finnish teacher from Vaajakoski, written for the Orthodox Church of Resurrection. He was given a free hand, but paid respect to both the Gospel traditions, and Orthodox tradition in writing this icon. In his icon, the face of Christ shines like the sun and his clothes are snow white as light of an innocent person, the garments of heavenly beings. The presence of light and dark cloud often signifies the Divine Presence, which also surrounded Mount Sinai when God gave the holy law to Moses. In the icon, light radiates from Christ to those closest to God: Elijah, Moses and the three disciples. Elijah stands to the left of Christ, representing the Prophets and the living, because he was bodily assumed into heaven. The expectations and mission of Elijah are fulfilled in the mission of John the Baptist. Moses is placed on the right of Christ, representing the Law and the dead, for Moses died on Mount Sinai. Pouta’s decision to show Moses as a young man is exceptional, for in other icons he looks old. He led the people of Israel from slavery in Egypt, but only glimpsed the Promised Land, never getting there. Both Moses and Elijah saw God’s glory on the Mountain and both announced the suffering of Christ. Moses, Elijah and Christ stand on three mounts. The three Greek letters on Christ’s halo form the shape of the cross. The central position of Christ, the fact that he is the largest size, and the blue outline emphasise that he belongs to heaven, that he is part of the creator, and that he is coming again. Blue is also the colour of water (baptism). The oval shape symbolises God’s kingdom, which is about to open its door to whole world. In Orthodox iconography, the colour red also tells us that Christ was born from the Virgin Mary, became flesh and ascended from earth to heaven. 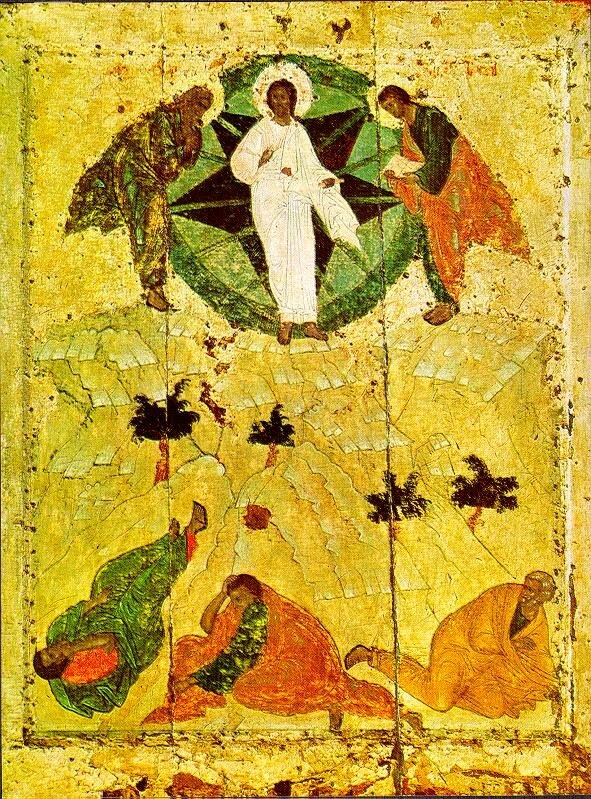 1, In the icon of the Transfiguration, Christ is always the central figure appearing in a dominant position, usually within a circular mandorla, although sometimes in an oval or almond-shaped mandorla. He is clearly at the visual and theological centre of the icon. He is dressed in white robes. His right hand is raised in blessing, and his left hand contains a scroll. Although his body may not look any different from how we should imagine it, Christ’s clothing is dazzling white. Remember how Saint Paul tells us: ‘As many of you as are baptised by Christ have clothed yourselves with Christ’ (Galatians 3: 27). In the icon by Theophanes the Greek, Christ is at the centre of a circular mandorla at the summit, with rays going down to the three disciples at the foot of the mountain. On the other hand, Moses and Elijah are outside the circle, and there are no rays reaching out to them. In icons where the rays reach Moses and Elijah, they are being drawn into the scene, into the event. But in icons where the rays reach out only to the three disciples, then the disciples, and the viewers too, the worshippers, are being drawn into this new disclosure of salvation. The mandorla is interpreted in Orthodox theology as the divine energies that suffuse Christ and, through him, the whole of creation. When the mandorla is circular, it expresses the accessible glory of God. Circularity is more inclusive, and leads us into Christ. Another good example of a circular mandorla is found in a well-known 16th century icon of the Transfiguration in the Monastery of the Pantocrator on Mount Athos. On the other hand, an oval-shaped mandorla, as in the Sinai mosaic, expresses the luminance of God and delineates in a more exclusive way. If the rays are drawn mathematically from an oval mandorla, the icon writer is making a statement about Christ as the Lord not only of time but also of space too. An innovation in the icon by Theophanes is the two huge, vector-like shapes behind Christ, expressing the two-fold character of the event – it is about both ascent and descent. 2, The Prophet Elijah appears on Christ’s right-hand side. 3, Moses is holding the Ten Commandments and is on Christ’s left-hand side. Elijah and Moses stand at the top of separate mountain peaks to the left and right of Christ. They are bowing toward Christ, with their right hands raised in a gesture of intercession towards him. If the event took place on one mountain top, such as Mount Tabor, why do you think are these two on separate mountain tops? 4, The three Apostles who accompanied Christ to the mountain, Peter, John, and James, are below Christ, and react to the vision of his Transfiguration. 5, The garments of the Apostles are in state of disarray, indicating the dramatic impact the vision has on them. The posture of three apostles in the icon shows their response to the Transfiguration. John in the centre has fallen prostrate. He is often shown having fallen head over heels supporting himself with his right hand and covering his face with the other. Peter is rising up from a kneeling position and raises his right hand toward Christ as he speaks, expressing his desire to build the three booths, tabernacles or tents. 6, The Apostle James reacts to the vision by falling to the ground or falling over backwards, attempting to cover his eyes with his hands to prevent him from seeing more. If the apostles’ eyes are closed or shielded, remember how Luke in his account says they were weighed down with sleep (Luke 9: 30-32) … and how these three later could not stay awake in Gethsemane. 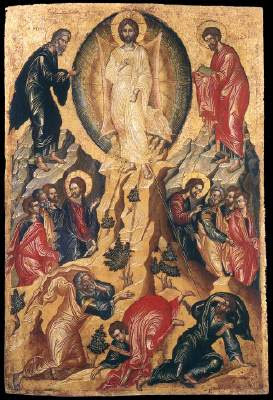 The two smaller scenes, introduced by Theophanes the Greek in the Tretyakov icon in Moscow, show that the Transfiguration is about both ascent and descent. To see the transfigured Christ, we have to leave behind the familiar, but we also have to come back down to earth again. There can be no staying permanently in an unnaturally extended religious comfort zone. Indeed, in the two smaller scenes in the Tretyakov icon, Christ is paying more attention to the disciples on the way down than he is on their way up. In Orthodox iconography of the Transfiguration, we have no static scene, but drama and a moment full of movement. The icon serves as a narrative to open our eyes and hearts to a different, more allusive way of looking at the Gospel: here are live, happening events, real human beings, and challenges to the past, present and future. In the icon by Theophanes the Greek, and many other icons of the Transfiguration, the three disciples look as though they still have to undergo their climb of the mountain. There is still a considerable distance between them and Christ. And so the icon does not tell of a world already reconciled; it lives with the tensions of an unreconciled world, it beckons and it challenges. The icon directs our attention toward the event of the Transfiguration and specifically to the glory of God as revealed in Christ. This event came at a critical point in Christ’s ministry, just as he was setting out on his journey to Jerusalem. He would soon experience the humiliation, suffering, and death of the Cross. However, the glorious light of the resurrection was revealed to strengthen his disciples for the trials that they would soon experience. 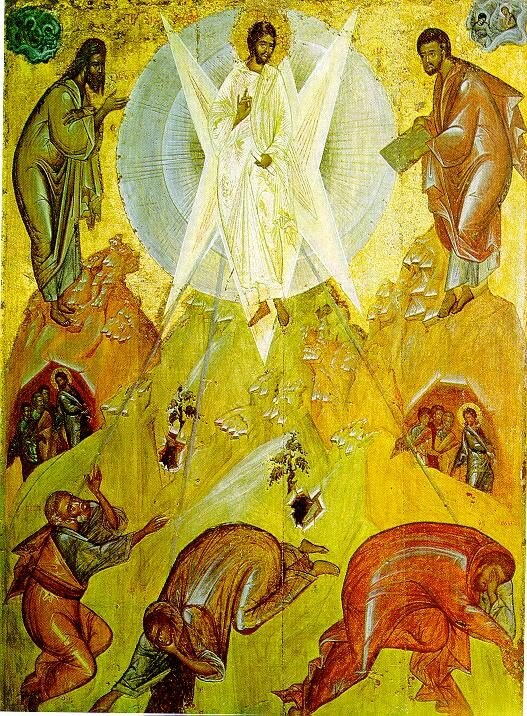 Why was the Transfiguration so eagerly adopted as Feast and as a theme in iconography in the Byzantine and Orthodox Church? The Transfiguration has immense Christological importance, for both the humanity and divinity of Christ are manifested to the disciples, and so to us. This was developed as a theological thought in a sermon on the Transfiguration once said to have been written by Saint Ephrem the Syrian (ca 306-373), but now thought to have been written by a latter writer. Nevertheless, you can see how the Transfiguration helped at that time to underpin the teachings on the divine and human natures of Christ, encapsulated in the Creeds of Nicaea, Constantinople and Chalcedon. The Transfiguration also points to Christ’s great and glorious Second Coming and the fulfilment of the Kingdom of God, when all of creation will be transfigured and filled with light. The vision of Christ in his glory and the experience of the divine light are at the very heart of both Orthodox mysticism and Orthodox eschatology. The ‘uncreated light’ is a hallmark theme in Orthodox spirituality, especially in the writings of Saint Gregory Palamas and the school of the thought that is hesychasm, which draws constantly on the themes of the Transfiguration. This was, therefore, not only a prefiguration of the eternal blessedness to which all Christians look forward, but also of the Kingdom of God already revealed, realised and come. ● Virtue, which is the active life of ascetic struggle, and which is represented by Elijah. ● Spiritual knowledge, which requires right discernment in natural contemplation or contemplation of the natural order, which was disclosed by Moses. ● Theology, which means contemplation of God, which requires the consummate perfection of wisdom, and which was revealed by Christ. The Transfiguration is both an event and a process. 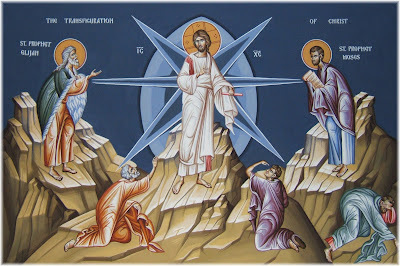 The original Greek word in the Gospel accounts for Transfiguration is metamorphosis (μεταμόρφωσις), and gives us access to deeper and more theological meaning, a deeper truth, than the word derived from the Latin transfiguratio, which can be translated by ‘to be changed into another from.’ But the Greek metamorphosis (μεταμόρφωσις) means ‘to progress from one state of being to another.’ Consider the metamorphosis of the chrysalis into the butterfly. The metamorphosis invites us into the event of becoming what we have been created to be. This is what orthodox writers call deification. Andreopoulos, Andreas, Metamorphosis: the Transfiguration in Byzantine theology and iconography (Crestwood, NY: Saint Vladimir’s Seminary, 2005). Baggley, John, Doors of perception: icons and their spiritual significance (London: Mowbray, 1987). Bulgakov, Sergei, The Lamb of God (Grand Rapids, Michigan, and Cambridge: William B. Eerdmans, 2008). Cunningham, Mary B., and Theokritoff, Elizabeth (eds), The Cambridge Companion to Orthodox Christian Theology (Cambridge: Cambridge University Press, 2008). Karakatsanis, Athanasios A (ed), Treasures of Mount Athos (Thessaloniki: Holy Community of Mount Athos, 1997). Lash, (Archimandrite) Ephrem, An Orthodox Prayer Book (Oxford: Oxford University Press, 1999). Nes, Solrunn, The Mystical Language of Icons (Norwich: Canterbury Press, 2004). Ramsey, (Archbishop) Michael, The Glory of God and the Transfiguration of Christ (London: Longmans, 1949/1967). Stevenson, Kenneth, Rooted in Detachment: Living the Transfiguration (London: Darton, Longman and Todd, 2007). Ware, (Bishop) Kallistos, The Orthodox Way (Oxford: Mowbray, 1979). (Revd Canon Professor) Patrick Comerford is Lecturer in Anglicanism, Liturgy and Church History, the Church of Ireland Theological Institute, Dublin, and priest-in-charge of the Rathkeale and Kilnaughtin Group of Parishes. This essay was prepared for a Bible study in a tutorial group with MTh students on 15 February 2017 and includes material first presented at a seminar on 6 April 2010.